Welcome to the home of Tourism Geographies. 2018 Google Journal Metrics ! 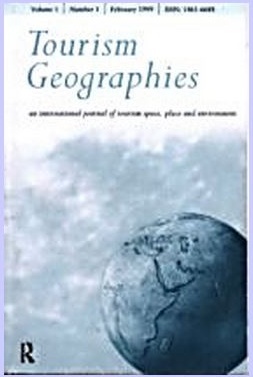 This site supplements the Routledge / Taylor & Francis publisher site for Tourism Geographies. The difference between the two sites is that this one is maintained by the journal's editor-in-chief, Alan A. Lew, and provides resources that may not be as easily accessible on the T&F website. Please use the menus to navigate to the both the resources on this site and those on the Routledge / Taylor & Francis website.